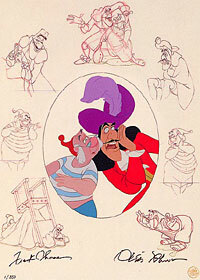 The final limited edition in the innovative Disney Masters Series showcases the work of Disney legends Frank Thomas and Ollie Johnston in “Hook and Smee”. This hand-painted, hand-inked cel is limited to only 350 works of art in the edition. As a finishing touch, each work of art is personally signed by Frank Thomas and Ollie Johnston – the final edition in the Disney Masters Series and the only edition signed by both animation greats.